Pre-paid cards (or payment cards) are increasingly being used by local councils as a way of making direct payments for social care. Instead of funds being paid into a Disabled person’s people’s bank accounts, funding is ‘loaded’ or paid into a card account. This means that councils can monitor in detail all transactions as they happen, and potentially may suspend an account, if they do not approve of how Disabled people are using the cards. Across the country, Disabled people have been told by councils that they ‘have to’ use a prepaid card, even if they have been managing their own funding for many years (2). We also know of a case in the South West where someone was threatened to a cut to their social care funding, unless they accepted a pre-paid card. As payments usually have to be made online, or over the phone, using a card may also be inaccessible for some Disabled people. Over a million pounds a year is spent on fees and operating the cards. Just two card companies were providing services to most local councils using payment cards. The way that councils use pre-paid cards varies widely across the country, with some using cards as way of restricting the way that direct payments can be used. However, despite this research and recommendations made by the ILSG to councils, there still seems to be widespread concern about pressure on Disabled people to accept a card and misinformation about their use. If you have been offered a pre-paid card as the only ‘choice’, or been pressured to accept a card by your council, the Independent Living Strategy Group would like to hear from you. Please note that they cannot, unfortunately, offer any support in any difficulty that you have with your Council but they will be raising concerns about prepaid cards with the Association of Directors of Social Services at a meeting in September. Any information you provide will not be used in any way which could identify you. Have your say on the future of adult social care – respond to the Local Government Association’s (LGA’s) survey. The consultation, which is the largest ever launched by the LGA, will last for eight weeks and will shape the LGA’s demands ahead of the Budget, due in the autumn. Izzi Seccombe, chair of the LGA’s Community Wellbeing Board, said: “People have a right to live the life they want to lead and high quality adult social care and support plays an essential role in this. It is also vital to society. It strengthens communities, reduces pressures on the NHS, supports around 1.5 million jobs and contributes as much as £46bn to the UK economy. should the postcode lottery be ended and a national system of social care be put in place working in a similar way to which the ILF did. You may not want to answer all of the questions in this consultation or feel they are all relevant to you but please answer those that you can and ask others to as well. Do also give examples of how the current system is failing to meet your needs either due to charging policies, refusal to provide help with specific tasks or unmet needs you have. sadly neither Welsh Labour not the national DPO – Disability Wales whose funding of course comes via Welsh Labour are supporting this vital campaign. Please find below an important Thunderclap that we should all get involved in to help save the Welsh Independent Living Grant, #SaveWILG. This grant allows disabled people with high care and support need to live independently and was introduced by the Welsh Government following the closure of the ILF. Unfortunately, the Welsh Government have decided to follow England’s lead and pass all responsibility for social care to Local Authorities. This cannot be allowed to happen as we all know the problem this has caused to our friends in England. This fight is important to disable people across the UK as if we manage to win the battle in Wales, it will add strength to the arguments for three tier support in England. ‘It is utterly unacceptable that anyone should be forced into residential care when they are healthy enough to live independently and with their families. And it doesn’t make sense for individuals or communities. The letters have been sent today (19 March 2018) and the CCGs have 14 working days to respond, after which decisions about starting court proceedings will be made. We are also finalising a postion paper “Independent Living Support for the Future”, outlining our ideas for developing an independent living support system capable of upholding disabled people’s rights, based on the views and issues raised at the conference. Once we have a finalised version we will circulate for sign up and put in place communications and lobbying strategies to build support for our shared vision. The Independent Living Strategy Group has also brought out a list of existing lists that can help when you are thinking what to include as DRE. And the government guidance on disability-related expenditure is available at: https://www.gov.uk/government/publications/care-act-statutory-guidance/care-and-support-statutory-guidance#charging-and-financial-assessment (it’s towards the bottom of the webpage). Simon Legg from the Spinal Injuries Association has also helpfully pointed out the 2003 practice guidance (attached) has a detailed discussion of disability-related expenditure and is arguably still valid. He also sent a copy of a judgement which relates to disability related expenditure, also attached. Campaigning against charging. Inclusion London will be organising a meeting for campaigners concerned about or involved in campaigns against charging – date to be confirmed – to share experiences, find out about relevant legislation and explore how disabled people in different areas can more effectively co-ordinate to challenge the introduction of harsher policies, monitor their impact and campaign for the abolition of charging. If you are interested to find out more please email ellen.clifford@inclusionlondon.org.uk. We believe it is important that Disabled people’s own voices are listened to within the government’s work-stream on social care for disabled adults. We have been collecting signatories a letter. United Nations complaint. We have now heard that the complaint made under the UNCRPD Optional Protocol against the closure of the Independent Living Fund to new applicants has been accepted. The UN have written to the government who have until the middle of May 2018 to respond. Media. In order to highlight the impact of the continuing social care crisis on disabled people, we are working with Cherylee Houston on features for Tonight and with the film-maker who produced “Dispossession: the great social housing swindle”. In November 2017 Disabled People Against Cuts and Disabled People’s Organisations involved in the Reclaiming Our Futures Alliance held a national Independent Living Campaign conference. The aim of the day was to take stock of the key barriers to independent living that Disabled people who use adult social care services face and assess how far the situation has deteriorated in the last year but also to explore a shared vision for an independent living support system that can truly uphold our rights. Below you can find notes and films from the day as well as copies of hand-outs and presentations. #JournoRequest:Sarah wants to hear from disabled young adults (20-30ish) who are desperate to move out of their parents’ home but struggling to find the accessible housing they’d need to live independently. Perhaps you’d need certain adaptations that housing providers and private landlords aren’t prepared to make, or your local authority doesn’t have enough accessible housing to meet the demand. You might even be considering buying your own place, and paying for the adaptations yourself, but that’s just not affordable right now. Whatever your situation, if you’re disabled and stuck living with mum and dad in your 20s, I’d love to hear about your experiences of trying to fly the nest. Please email or message me if you can help – contact@sarah-graham.co.uk. It’s for a sensitive feature looking at the problems disabled millennials face accessing suitable housing – case studies do need to be happy being identified. Many thanks to Inclusion London for this useful analysis. On the 1st of September the Court of Appeal handed down its judgement in the case of Davey v Oxfordshire County Council. In this case Luke Davey, who is a former Independent living fund recipient, challenged a 40% cut to his personal budget after the closure of the ILF. To us the case also clearly demonstrated the limits of judicial review in cases where disabled people are trying to argue against professional opinions of social workers. Judicial review does not look at whether local authority made the right decision or the best decision; it looks at whether or not the decision was lawful. The duty to promote wellbeing in section 1 has 2 aspects: firstly it requires local authorities to take positive steps to promote wellbeing, and secondly it requires local authorities to pay regard to circumstances listed in section 1.3 of the Care Act 2014. The wishes of the disabled person may be a primary influence, but they do not amount to an overriding consideration. The UN Convention on the rights of Persons with Disabilities can be used to help interpret the law (with caution), however in this case no particular ambiguity was identified and the balance between person’s wishes and LAs views has been struck in the Care Act itself. However the Court of Appeal acknowledged that this should not prevent from this point being raised in future proceedings. The judge confirmed that the council was entitled to set a pay of PAs at a lower rate as long as it reflected local market conditions and that the law did not require it to pay for a more expensive option, which was preferred by an individual. The judges were prepared to accept social worker’s view that the rates reflected local market conditions. This however potentially puts into questions provisions in the Care and Support Guidance which say that local authorities should choose not the cheapest option, but the one that is best value for money. The guidance clearly says they should go for an option that better promotes wellbeing and delivers the outcomes for an individual. Inclusion London intervened in this case. We wanted to show that the case was not just about Luke’s care package. It could have an impact on many Disabled people. Our intervention helped to draw media attention to this case and enable us to talk about our right to independent living in mainstream media. We also believe our intervention helped to clarify the point that local authorities have to consider what might happen in the future when there is an imminent risk of negative consequences as a result of their decisions. Besides the fact that Luke lost and the impact this will have on his life, the biggest concern in this judgement from our point of view is the statement about intensity of judicial review in social care proceedings. The Court of Appeal effectively warned against overzealous analyses of social care assessments. This is worrying, because life changing decisions are made based on those assessments, and unfortunately there is no other way to properly scrutinise them. This is why we will continue to lobby for the appeals system, which was meant to be introduced by the Care Act 2014. The fact that local authorities at the end of the day make final decisions about our needs and how we will be supported is not new. The law has always said this. However many of us felt disappointed when we saw the judgement. This firstly is because the case clearly shows that in the age of austerity, when local authorities have to find significant savings, the provisions of the Care Act about choice and control do not have teeth. It also is disappointing for us to see how our views can so easily be overridden by professional opinions of social workers and local authorities not being properly scrutinised for some of the decisions they make. This case clearly shows that local authorities can get away with implementing even very significant cuts if they follow the process set out in the Care Act and can give a logical explanation to their decisions as well as commiting to reviewing the situation and stepping in if things go terribly wrong. Challenge decisions: yes this case was not successful, but it cannot and should not deter others from challenging cuts to their support. We lost this battle, but we will keep fighting. Nathan Davies is fighting a lonely battle against the closure of the Welsh Independent Living Fund and devolution of funding to Local Authorities in Wales. Sadly the influential DPO Disability Wales saying they are unable to support his fight as it is too political. Nathan has already been told his care and support funding would be slashed by more than half once the Welsh ILF is closed from April 2018. This would mean Nathan could no longer take part in those community activities that are essential to his wellbeing and inclusion in society. If you can please email any Assembly Members and ask them to retain a separate Independent Living fund in Wales. Disabled Lives Matter and the UN has said in their recent response to the periodic review of the UK that central governments are ultimately responsible for ensuring adequate funding for independent living. 7pm in Council Chamber – our deputations will speak to councillors, please come and support. No to charging, rationing, profiteering and neglect. 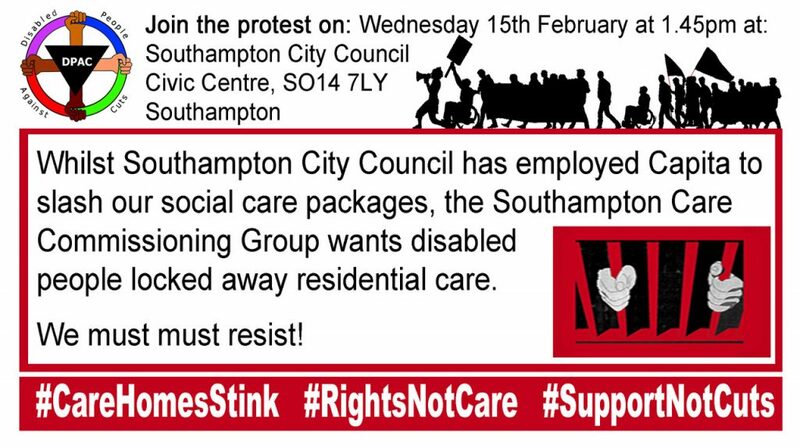 Southampton Hots Up – Battle for Independent Living Continues. This letter has come from the leader of the council. I appreciate that some of you prefer to demonstrate against the Labour Council rather than the Tory government. But if you are going to do this please have the decent thing and contact us and check whether the thing you are demonstrating against is true. I know we are in the era of ‘alternative’ truth and ‘false news but we do expect you to know better. 1. The Care act came in in April last year and requires us to complete annual reviews of all those in receipt of a care package. This created an additional burden on our already stretched social workers. It was proposed and approved that the Council employ through Capita additional social workers to carry out these reviews. 2. No instruction was issued with regard to the outcome of these reviews. No incentive was given to Capita to save money we simply wanted the reviews done. 3. Capita were unable to recruit enough Social workers to complete the work and an offer was made to the ones they had to work some weekends for an extra payment (£200). 4. The vast majority of these reviews (all of which were carried out by fully qualified and registered social workers) lead to no change. Some were adjusted to change the way a service was delivered using modern technologies and these have lead to a saving to the Council. A saving that means less jobs will be cut this year and less other services reduced. 5. An appeals process exists with these assessments’ which has been used by precisely zero clients. 6. As part of our arrangement with Capita we are gradually taking over this work with our in house team working alongside Capita employees. We expect in due course to take over all these reviews. These are the facts – so please tell me what you are demonstrating about. So if those are the facts why do the leaked emails say – either the Labour council leader has no idea about what is happening in Southampton or -well – or he’s just downright lying. Take your pick. The cavalry is on the way!!! Have just heard from Adam Tait we have 3 new colleagues joining us on Monday, pulling the stops out to make sure they can ‘hit the road’ with you with the minim delay. Adam is also suggesting some incentives for the Team. He is well aware of some of the difficulties we have had, and that you are giving me the best performance you are able. But, now we need MORE!! The suggestions below are cut & paste from Adams e-mail to me. I’m not sure how weekend working might go down with the existing team (as a one off) but if we included these days we have an extra 4 days available for eight of the team people and two available for 11 of the team until we have TIB on 27th September. I would suggest we offer an extra incentive if any of the team are prepared to work these weekends or part of…. starting this weekend. It’s short notice but if we paid their existing rate at time and half or double time you may get some take up? I’m not sure if we would need to report these days within the MI suite but that’s not my call. An alternative might be payment of increased hours worked in the week. Again as a one off. In addition, as the next week or so is so critical I am happy to roll out an extra incentive scheme at the earliest point whereby if a person manages to improve their performance by x% from the previous 4 week average they receive a £y bonus. 10% = £100, 20% = £200 etc. This can be measured across both productivity levels and the savings achieved. If one person improves their productivity by 20% and savings by 20% they receive a £400 bonus. PLEASE READ CAREFULLY AND CONTACT ME NO LATER THAN 5PM WITH YOUR RESPONSE (EVEN IF YIOU ARE NOT INTERESTED) THIS IS NOT A LONG TERM COMMITMENT – IT’S EMERGENCY FIRST AID TO ENSURE OUR SURVIVAL!!!! If you want to discuss with me you’ve got my numbers. Another late night last night – Conference Call. Followed by several hours ‘bashing my brains’ for answers. As you know our Productivity and the Financial Efficiencies we are making are under great scrutiny. Looking at all the figures in the Reports last night it was very clear that both Productivity and Efficiencies have fallen dramatically. By commissioning this Project. They in turn are being asked to explain to Councillors of SCC. Issues such as changes to the Team, Reduced size of Team, Annual Leave, Bank Holidays etc. have all been taken into account but things still don’t add up. I have stressed how hard you are all working – but we don’t appear to be getting the results we had during the Pilots. As I said at the Team Meeting yesterday I think it may be about the ways in which we are working – IF IT’S NOT ABOUT HARD WORK, IT MUST BE ABOUT SMART WORK!!! I HAVE PUT MY NECK ON ‘THE CHOPPING BLOCK’ – YOU HAVE PRODUCED THE RESULTS BEFORE, I KNOW YOU CAN AND I BELIEVE YOU WILL DELIVER THE RESULTS REQUIRED. NOW I HAVE TO PUT MY MONEY WHERE MY MOUTH IS – PLEASE HELP ME!!!!!! L.D WILL TAKE A LITTLE LONGER – THIS IS RECOGNISED BY ALL. 15 min. CALL OUT!! TELECARE –IN!! CAREFUL ATTENTION WHEN RECORDING WORK SHEETS, YOUR WORK SHEETS INFORM THE WEEKLY REPORTS FOR THE DECISION MAKERS – DON’T SHOOT YOURSELF IN THE FEET!! THE WORK SHEET IS CHANGING THIS WEEK PLEASE TAKE EXTRA CARE. THINK ABOUT ASSET BASED ASSESSMENT, FOR THOSE OF YOU NOT FAMILIAR I WILL BE SENDING INFORMATION. We don’t have very much time to turn this situation around. if we can’t/don’t do it all the hard work you have put in so far will have been for nothing. Not to put too fine a point on things WE ARE ALL ON THE WAY HOME. I AM NOT ASKING YOU TO STAND BEHIND, ME I’M ASKING YOU TO STAND BESIDE ME SO WE CAN BRING THIS PROJECT TO A SUCCESSFUL (FOR ALL OF US!!) CONCLUSION TOGETHER. Capita offered their staff bonuses of up to £400 to cut people’s packages (Capita said that this was never introduced but they haven’t denied that they made the offer). Capita’s freelance social workers were paid more than £1,000 a week (after tax) and put up in three-star hotels while they were encouraged to cut people’s packages. The emails clearly show that they were asked by the council to produce savings (ie cuts). The Council Leader says “. Some were adjusted to change the way a service was delivered using modern technologies and these have lead to a saving to the Council.” We do not believe Telecare is an acceptable alternative to human support and nor are packs of incontinence pads. If the council leader thinks the following email from a Capita manager is acceptable, then he should be ashamed of himself and needs to resign: The manager suggested an “extra incentive” for the team if they could improve on their previous “performance” and suggested that the bonus “can be measured across both productivity levels and the savings achieved. If one person improves their productivity by 20 per cent and savings by 20 per cent they receive a £400 bonus.” The council never commented on the ‘extra incentive’ email, we can’t think why not. Another thing to note is that the whistle-blower said that it was the service-users with no support networks to advocate on their behalf with the council who were often the ones who were having their packages cut. This might explain why there have not been any appeals (if that’s true). I suspect that, if you take away the care packages that included residential care (which are almost impossible to cut), the proportion of direct payments packages that were cut is significant. For an ongoing legal challenge we urgently need to hear from anyone whose direct payment rates haven’t increased for years and who use agency carers and have been told by the agency that they can’t fully meet their needs because the hourly rate is not high enough. I’m Martyn and I sit on the NUS (National Union of Students) Disabled Students Committee. This Wednesday (26th October) from 1pm, we will be launching a new campaign where we will be fighting the high prescription costs that the NHS has been charging over the last few years. While this area of work will mainly be focusing on students, we will also be looking at the impact that these prescription costs have on the general public as well as fighting the charges to either have them scrapped or heavily reduced. The current cost of an NHS prescription is £8.40; and in the last five years alone medication costs have increased over £1. When you are on no or a limited income, this is a charge that is not needed and can result in an even greater financial pressure for us to just maintain a basic level of health. Furthermore it is bad enough when you have to pay this once, but when you have to pay this every month for several items the cost soon mounts up. Add on other costs such as optical and dental charges and this annual total can be too much for people on a decent income to afford, let alone disabled people. Even though there are some financial options for saving money such as pre-payment certificates, this is still not enough. Similarly a few of us are lucky to be exempt from these charges for a variety of reasons, however the majority of us don’t qualify for this. With the increasing cuts that the government are placing on us, this is becoming even harder to get. As such, we are launching and running the cut prescription costs campaign and it will be great if as many of you can support us as much as you can. From 1pm this Wednesday, it would be amazing if you could take to social media using the hashtag #freeprescriptions to both promote the campaign and share your experiences of prescription costs and having an impairment. There will also be further information coming shortly on the different things that we will be doing and working on in order to fight the prescription charges and have them cut. This will also be an indirect fight at the cuts that the government have been imposing on people like us who are disabled. Again, it will be great if you could support us and get involved with it. The more people there are, the stronger we can be and the more likely it is that we will win. Furthermore, on November 19th, NUS and UCU will be marching through London against many different issues that we are facing. Disabled people’s issues such as these will be at the forefront of the demo. For further information, see NUS National Demo on Facebook or Google search it. I will be keeping DPAC notified of everything that we are doing so that you don’t miss out on this campaign including any information and so that you can get involved with what we are doing. I hope that many of you can get involved in some way. It will be amazing if you can take to social media from Wednesday at 1pm of promote our campaign AND share your experiences! As some of you will know there were changes in Blue Badge entitlement as a result of the introduction of PIP which meant that anyone who could walk regardless of other impairments such as Autism, MH or visual impairment were no longer able to qualify for a Blue Badge. This change affected one of our supporters whose son had previously been entitled to a Blue Badge for around 30 years and the Local Authority involved refused to renew their badge when it ran out earlier this year. The result of that has been that the person became virtually housebound as he frequently had meltdowns and his PAs needed to be able to get him into the car quickly. We referred this person to one of the solicitors we often work with Louise Whitfield of Deighton Pierce Glynn and we are delighted to report a very successful outcome. Not only have the Local Authority backed down and renewed the Blue Badge but even without the case having to go to court The Department for Transport have agreed to carry out a review of the entire Blue Badge policy and its approach towards people with “non-physical disabilities. The DfT have said: “I can confirm that the review process has now begun internally. The Department’s Blue Badge policy team is undertaking the review. They intend to involve the Department for Work & Pensions, Department for Health, lawyers, local authorities, DPTAC, disability organisations and mental health experts. DPAC is asking for donations for an Independent Living Fighting Fund to support individual Disabled people to challenge cuts to their social care support packages following closure of the ILF. The ILF campaigners fought fiercely against the closure, taking their protest right to the doors of the House of Commons chamber, exposing to the world the disgraceful way the UK government is treating its Disabled citizens. The Fund finally closed on 30 June but the fight is far from over. Disabled people hit by the closure need solidarity now more than ever as the cuts we all fought so hard to prevent start to kick in. The government said the closure of the ILF was a transfer not a cut (http://www.theguardian.com/society/2015/jun/11/impact-of-changes-to-disability-benefits). This was a lie. Some notable Councils such as Hammersmith and Fulham have committed to protecting people’s support packages in the short-term but in other areas serious cuts are already starting to happen as former ILF recipients are re-assessed to determine the level of social care support their Local Authorities will continue to fund. 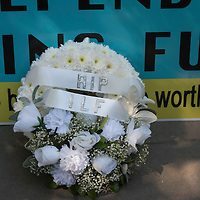 In Waltham Forest for example nearly 90% of former ILF recipients have had their support package cut as a result of the closure of the ILF, with more than a quarter having a cut of 50% or more (http://www.disabilitynewsservice.com/independent-living-fund-shocking-drop-in-support-after-ilf-closure/). Cuts of this level mean robbing Disabled people of independence, dignity and equality. It also places people at risk as tragically evidenced by the case of Amanda Richard (http://www.dailymail.co.uk/news/article-3266218/Disabled-mother-died-house-fire-24-hour-care-cut.html) who died in a house fire in Coventry after her support hours were cut. Forcing use of incontinence pads on Disabled people who aren’t incontinent is emerging as one common tactic, as is blanket removal of night-time support and increasing expectations on, often elderly, family members and neighbours. One former ILF recipient was told that if she wanted to continue attending her community choir, other members of the choir could assist with her physical needs in place of needing paid support hours. The reassessment of another made a recommendation for behaviour therapy in order to cope with the removal of their night-time support following closure of the ILF. Disabled campaigners warned that the closure of the ILF signalled the end of independent living for Disabled people. Local Authority administered care and support has proven itself unable to consistently provide Disabled people with adequate support to live, work and study in the community with the same chances as non-Disabled people. The current crisis in social care funding means things are only getting worse as Councils consult on further cuts to community support (http://www.disabilitynewsservice.com/council-is-trying-to-push-through-care-cuts-without-proper-scrutiny/), meanwhile investing in the building of new ‘super care homes’ to house Disabled people en masse (http://www.disabilitynewsservice.com/threat-to-independent-living-as-council-plots-raid-on-high-cost-care/). Having lost the legal challenge to quash the decision to close the ILF it is now imperative that support is available for each former ILF recipient at risk of cuts to essential support. There are a number of dedicated solicitors committed to providing legal advice, however changes to legal aid mean that some Disabled people are no longer eligible yet not in a situation where they can fund the legal action they need to challenge what is happening. It is also true that we cannot reach every former ILF recipient affected and we also know that many are too frightened to speak out for fear of losing what support they have got. Legal challenges are an important way of testing out the rights of former ILF recipients under the Care Act 2014 and making examples out of Local Authorities that are not meeting their legal duties. This is why we need a fighting fund available to support legal challenges by former ILF recipients not eligible for legal aid. Donate to the fighting fund. We have cases that need to be actioned in early January so the sooner you can give the better. To donate go through DPAC’s paypal or contact us via mail@dpac.uk.net for details for a BACS transfer. Include “ILF FF” as the reference. Circulate this post to your friends, family and fellow campaigners asking them to donate too. Today is a very, very sad and tragic day and I think some of us are starting to cry up the front here, because this has been a long campaign and it has been so important to so many people because it means so much, but this isn’t the end and I think what last Wednesday showed is that disabled people are strong when we unite with our allies, we fight back and we give them hell. I come in peace with my horse to save the ILF. We are fighting for independent living for disabled people in the UK in 2015. Can you believe that? We have had enough. The Independent Living Fund closes tomorrow and we are not going away. We are going to fight on. The ILF has given me freedom. It has given me indpendence, to live my life the way I choose without being reliant on friends or family. Without being stuck to a regimented regime of getting up in the morning when it suits other people, to go to bed at 9 o’clock, I was 22 and I had to go to bed at nine o’clock, can you imagine. I was told when I could go to the toilet, once a day at one o’clock, if I wasn’t there on time then tough, I’d have to wait until a later call that evening. It’s just not just me, it’s thousands of people out there who are subjected to this. This is from Leanne. Hi all, I wish I could be with you all today but unfortunately, I can’t but please know that I am with you all in spirit, this is not the end, it is just the beginning. There used to be a time when governments, particularly when the ILF came in when they were able to at least talk about independent living with a straight face and now when they do it’s very much with a forked tongue. When the ILF closes today, it is more than just the closure of a fund. I think it signifies very much the end of an idea and that idea was that society was very much prepared to meet its responsibilities to make sure that equality of opportunity was something more than words. And we took tangible steps like the Independent Living Fund which got people real lives beyond looking out the window and watching the world pass them by. It is often said that the Queen is special because she has two birthdays. But in fact, there are another 18,000 people who have two birthdays: the day they were born, and the day they received their first ILF payment. My first ILF birthday was in 1988, when the Independent Living Fund was introduced. For people with high support needs, it was a great birthday, changing our lives overnight: we became part of our communities, went to college, got jobs, made friends, and generally did the things that non-disabled people take for granted. I met Mike and Darren who have become not only my personal assistants but also life-long friends. ILF was a springboard for a new life, whereas Direct Payments are a safety net. Direct payments help you out of bed in the morning. ILF gave you a reason to do so. My fear is that we are going back to the days without hope or purpose. In 1964, I became disabled. Not by being involved in an accident or being ill. I became disabled with one simple sentence from a consultant: “Mr and Mrs Punton, I am sorry to have to tell you but your child has got cerebral palsy.” From that moment, society believed that I had no purpose or future and prescribed special school followed by a life sentence in an institution. My parents disagreed, and I remember my Dad saying, “well, it is not rocket science that you shouldn’t let other people govern what you do.” And my Dad should know, because he was a rocket scientist! But even so, I was still forced to live the life that society prescribed. Then, in 1988, three things happened. Thirdly, I got my first job. Secondly, I moved into my first flat. Firstly, and probably most importantly, I applied and was accepted for ILF. Without the first, I am sure the other two would not have been achievable. The ILF changed my life. It gave me access to the wider community of Birmingham and beyond. It allowed me to meet fellow like-minded people who taught me how to see myself in a different light and introduced me to the concept of social justice. It allowed me to work, start my own community interest company, and empower other people. I even stood as a candidate for parliament at the last election. Fortunately, the wisdom of the people prevailed! But because of ILF and the British democratic process, it is possible for me to sit here and speak to you. The question is, will Robert Punton the younger be able to do the same? ILF has changed our lives, and how we see life. I am desperately sad that the decision of 2010 meant that an opportunity open to all was suddenly closed, which has led to it being labelled elitist. That was not the original intent or purpose. On the 19th June 2015, we received our final instalments of ILF. My concern, and the concern of thousands like me, is that come the first of August, the restrictions of the new definition of community care, will not allow me to continue to participate in my community and I will find myself returning to the lifestyle of pre-1988. If you will allow me a bit of poetic licence, I do not wish to return to the shadows of society but want to help light my community. Please allow me and many like me the opportunity to participate. Today (30th June 2015) the Independent Living Fund is officially closed at midnight by a heartless Conservative Government –the working concept of independent living is effectively silenced. A fine campaign was, and will continue to be fought by ILF users and Disabled People against Cuts. On the 24th June ILF users and DPAC stormed the parliament in scenes previously unwitnessed in the British Parliament, but the fight began a long time before that day. The fight for independent living for disabled people has been ongoing for decades; the fight to #saveilf began in 2010 when DPAC asked those affected by the closure to new users to come forward for a court case against the Government. Disabled people have always had to fight for their human rights and equality. People marvel at the number of demos and direct actions that have been carried out, but its what disabled people have always needed to do. 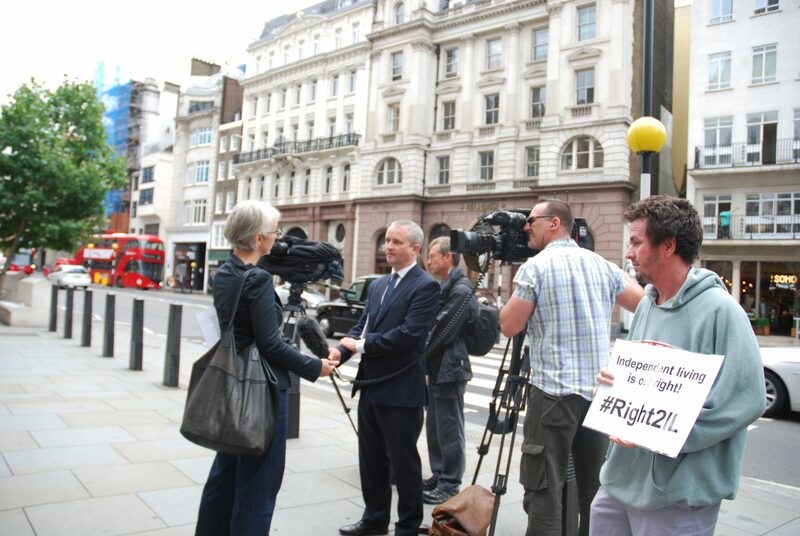 The ILF campaign has been a huge success in alerting the public, the press and TV nationally and internationally to the intense cruelty of a Government who declare they will support those in greatest need and simultaneously close the very efficient ILF which was doing just that. The closure makes no economic sense ILF had running costs of 2% while cash starved local authorities have an average of 16% running costs. On the same day as the closure a #disability confident event was being run in Swansea –this is beyond ironic and highlights the theatre of duplicity that this Government engage in. While ILF users face cuts in support, sometimes of up to 70% or face the fear of being institutionalised, while they face the loss of jobs, staff, PAs, education and life-our Government preaches #disabilityconfident . 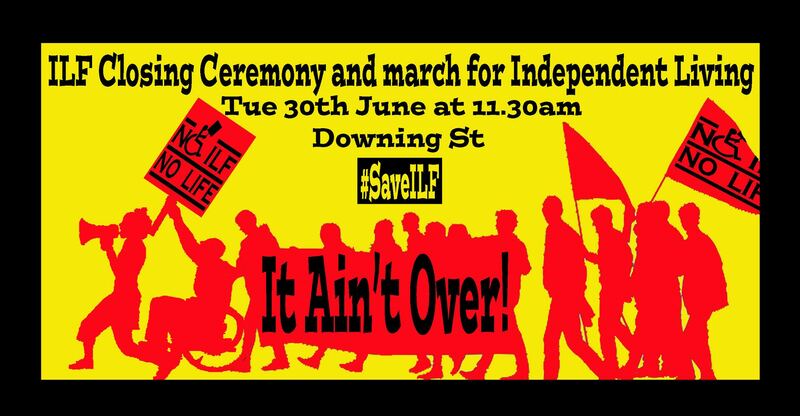 We want to pay homage to all those that protested on the streets and online to #saveILF, as many others have said – this is not over- we go on fighting! We will take back independent living on our terms so that it can never taken from us again- that work begins now. It is a sad day today, but it also one of pride for the dignity, force and dedication disabled people and our allies have shown in the fight for ILF- the fight for independent living will continue, the continued exposure of what the Conservative Government have done to disabled people will be shouted loud and clear as we join with more and more allies in solidarity against the evil that is being done to us under the myth of austerity -our rage like our strength will grow till the human rights we deserve are ours. 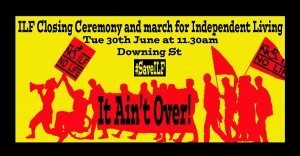 On 30th June, the day the ILF closes, ILF recipients, campaigners and Allies will meet outside Downing Street to hand over petitions calling on the Prime Minister to protect Disabled people’s right to independent living. Over 25,000 signatures have been collected online (supported by the brilliant video made by the stars of Coronation Street) and also during the Graeae Theatre Company’s 2014 UK Tour of The Threepenny Opera. After laying a wreath for the ILF, Schimmel, the equine star and proud battle horse of the Threepenny Opera will lead a march to the Houses of Parliament to continue the fight for dignity and equality. But this isn’t theatre… It’s real and it’s our lives. Meet 11.30am outside Downing Street. Q2 Have you received the details of how much money you are being allocated and if so how much? Q3 When will be starting reassessments of ILF users and wjen do you anticipate completing those assessments? Responses were received from 147. At the time of responding to the FOIs 12 said a decision had not yet been made as to how they will use the money with 2 if these explaining that they were waiting for confirmation of the amount of monies they will be receiving from central government before they decide. 31 said they will not be ring-fencing at all while 60 have decided to ring-fence to their Adult Social Care budget. 3 LAs will be ring-fencing to individual ILF recipients for a set amount of time (Camden for three months and Enfield and Slough for six months) while 9 said they will ring- fence individual awards until review and reassessment of individual support packages over the course of the nine months. 28 LAs responded that they will be ring-fencing to individual ILF users up until the end of March 2016. Those Local Authorities are Bath, Bedford, Birmingham, City of London, Cornwall, Derbyshire, Greenwich, Hammersmith and Fulham, Hartlepool, Herefordshire, Hertfordshire, Hounslow, Islington, Kingston, Lambeth, Lewisham, Medway, Merton, Middlesbrough, Richmond, Rutland, Shropshire, South Gloucestershire, Southend, Stockport, Trafford, Wokingham and York. 88 out of the 147 Local Authorities who responded said they had not received details about how much money will be transferred from central government. 41 said they have an indicative amount they are working to based on the amount paid to ILF users now minus the 5% “attrition rate” the government will be top slicing. Only 15 said yes they do know how much they will be getting. Most LAs (78) are aiming to have completed reassessments of all ILF recipients in their area before 30 June 2015. 30 do not have a timescale for completion while 17 LAs have set a target date later within the next nine months. 12 LAs said reassessments would be completed between July 2015 and March 2016. 7 said they had already completed theirs. For those LAs who said they had completed their reassessments it was not clear whether all of them were referring to reassessments to calculate the support package ILF recipients will receive from the LA after transfer from the ILF or whether they had answered the question in relation to the joint transfer reviews with ILF assessors which were conducted as part of the transition process. Some LAs who have committed to ring-fencing such as Stockport, Islington and Kingston have also completed their reassessments. Others such as South Gloucestershire will be reassessing over the next nine months. This has been written for people who do not have a legal background. However, any individual who is considering legal action in relation to problems with their support should not rely only on this guide but should seek specialist advice, including legal advice. These FAQs have been prepared by Kate Whittaker together with DPAC supporters who are ILF users, Inclusion London and Disability Sheffield Centre for Independent Living. Individuals and local groups are welcome to re-use extracts and are free to copy it and send it round by email. If extracts of the paper are used in other publications please state that the content was taken from this guide. Kate is a consultant solicitor at Scott-Moncrieff & Associates, a national firm of solicitors specialising in community care, public law, mental capacity and other civil liberties work. Scott-Moncrieff & Associates have a franchise with the Legal Aid Agency to provide legal aid work in these areas. Kate also provides independent legal consultancy and training. She specialises in cases involving disabled adults and children and others who need care and support from public bodies. As well as working as a solicitor Kate works closely with a number of disabled people’s organisations providing advocacy and other services, including Disability Sheffield where she is a trustee. Disability Related Expenses – what could you claim for? If you get care funding from your local council this is often not free and you will have to have a financial assessment to see how much they will ask you to pay towards your care. In order to reduce the amount you have to pay for your care here is a list of Disability Related Expenses which they should disregard as available income, thus reducing the amount they ask you to pay. These are not costs you can claim for. This is not an exhaustive list and if there are any glaring omissions please let us know. On the ILF email group we’ve been chatting about Disability Related Expenditure and I have collated people’s suggestions which have been very helpful. You could argue that, as a visually impaired person, you need a large print crossword book, which costs more than a regular crossword book. The difference in price would be the disability related expenditure. A lot of councils will not take transport cost into account because they can’t take the mobility component into account – but if you can demonstrate that your full mobility component goes on the hire of your vehicle, then you can argue that fuel costs are a disability related expenditure as there is no other suitable alternative transport. There are definitely many expenses that people don’t even think of, or expenses that people find hard to justify to the council – so giving a list of expenditure with reasons why they are “disability related” can often swing it. Shopping – internet deliveries (again be careful with this as social services may say you don’t need care to go shopping and point out you need someone to put food away for you anytime within a 2 hour delivery slot). Food costs and dietary needs including more frequent small meals or meals which may need to be left for people to reheat. Extra costs of things like clothes and shoes – the difference between cheap ones -from-primark and something-which-actually-works. Extra washing powder, more expensive washing powders or fabric softeners. Having to put money aside for future needs eg. repairs to equipment, deposit for Motability vehicle etc ( look at last 2-3 years ). If the local authority decides to take into account your disability-related benefits, it must also take into account your disability-related expenditure in the means test. This is confirmed in Annex C of the statutory guidance where it is stated that you should be allowed to keep enough benefit to pay for necessary disability related expenditure to meet any needs that are not being met by the local authority. A similar requirement is made in the charging regulations. Some local authorities disregard set amounts to take account of disability- related expenditure partly to avoid having to ask questions that might be considered intrusive. The amount that is disregarded varies from authority to authority. However if you consider your disability related costs are greater than this set amount you can ask for a full assessment of your costs. lany transport costs (both for essential visits to the doctor or hospital, but also to keep up social contacts). It can be difficult to prove you have extra costs if you have not actually incurred those expenses, for example, if you have not put the heating on for fear of large bills, or are not following a special diet because of the cost. Local authorities should work out an amount considered to be normal expenditure on heating, for example, for your area and type of housing to assist them in their response to if you claim disability-related expenditure in this context, or what you would spend if you weren’t avoiding it out of fear of high expenditure. There may be other costs that should be accepted. pets – insurance and food – for acompanionship and to feel safe.